Like last month, February wildlife adventure was all about the birds; it’s been a bit too cold on a regular basis for much insect goings-on. That’s fine–I enjoy feathered friends and entice them to my gardens in winter with food and water. I’ve seen this single gal-I think she’s female because she’s quite large, perched atop trees around my home many mornings throughout this past month. She’s a Red-tailed Hawk, Buteo jamaicensis, and I hope a juvenile hawk, not ready to take a mate yet, rather than an adult without a mate. That would be sad. I’ve also seen her hidden in Live Oak trees, upsetting the Carolina Chickadees and scattering the feathers remaining of her meal of White-winged Dove. She’s magnificent, sitting at attention early in the morning or as she glides from tree to tree, on the hunt in the neighborhood. 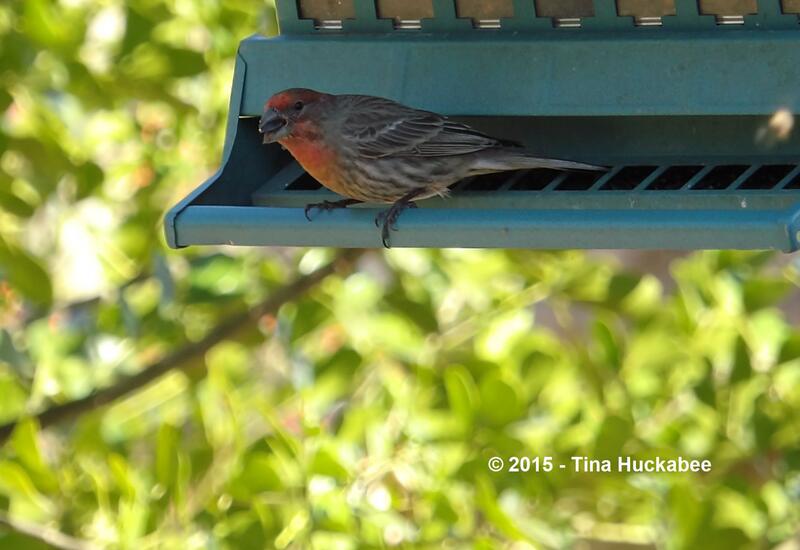 House Finch, Haemorhous mexicanus, is a common species of bird living year-round in my gardens. I realized that I didn’t have any photos of this charming, gregarious finch. 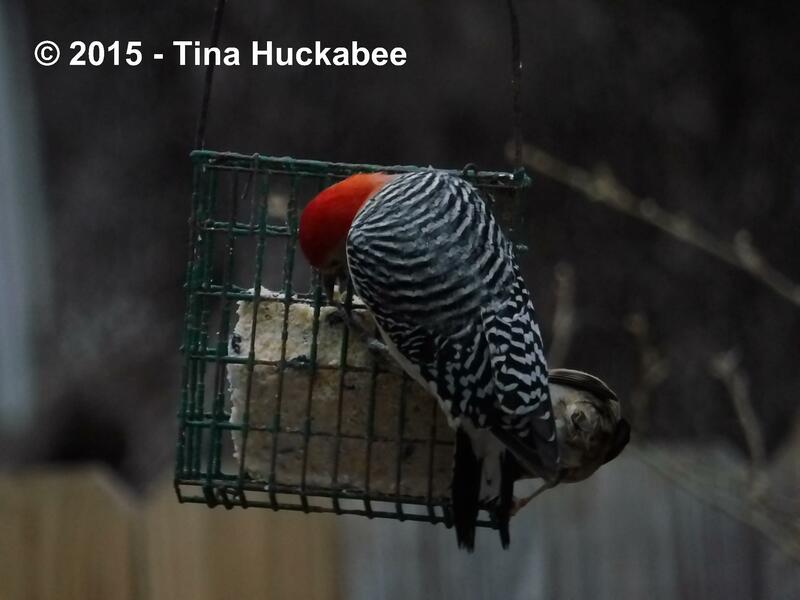 Here, this male munches a sunflower seed. I need a companion photo of a female House Finch–they’re not as colorful, but cute and perky, nonetheless. 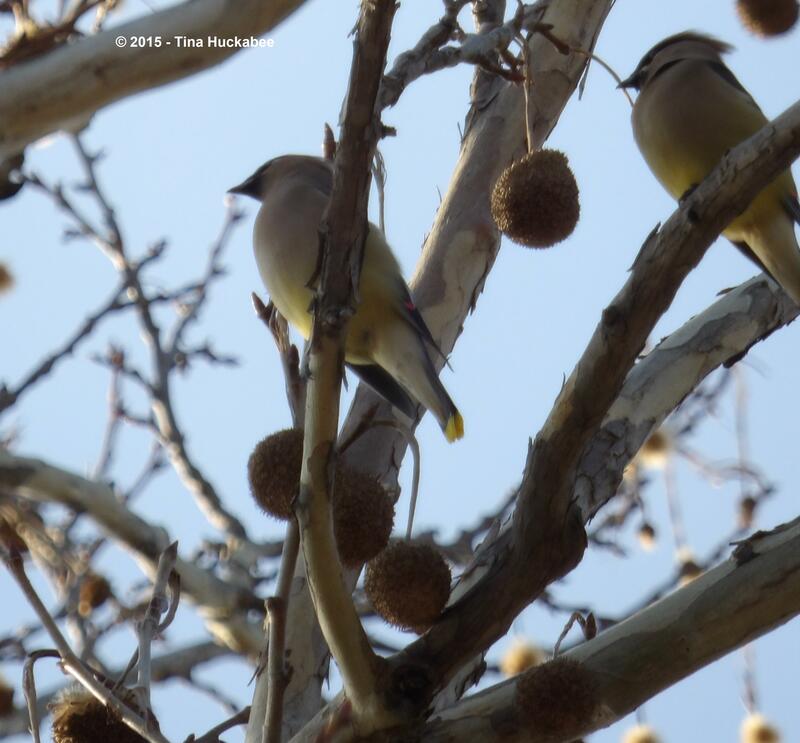 Every February I look forward to the hordes of the migratory bird, Cedar Waxwing, Bombycilla cedrorum. I usually hear them before I see them; they travel in groups and sing with a high-pitched keening as they swoop across the sky to settle in trees. …and posing so you can view them at best advantage. 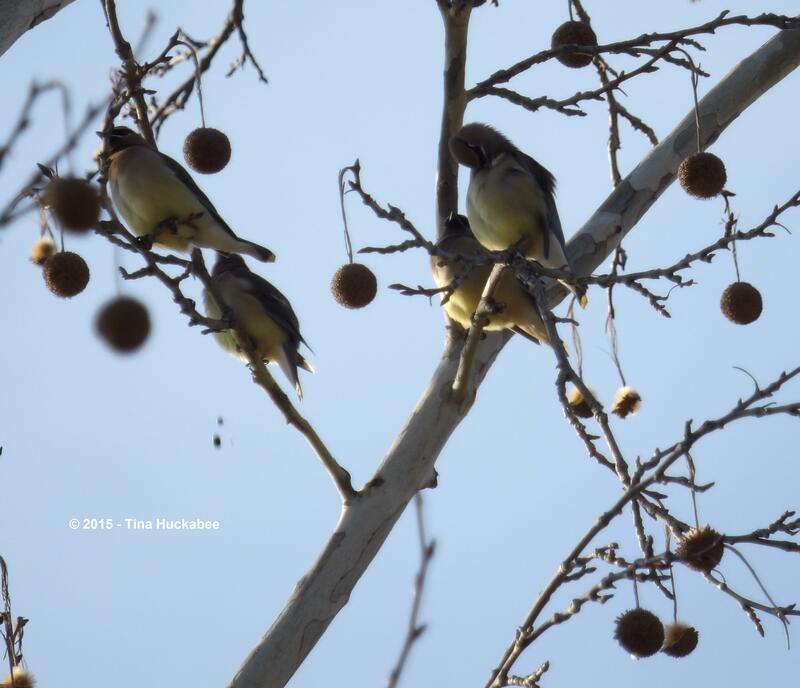 Cedar Waxwings are social birds too; they remind me of those girls in high school who can’t do anything alone–they go everywhere and do everything in a group. ….splashing, with flashing of red and yellow, and dashing in their Mardi Gras-esque masks. Can birds be full of themselves? 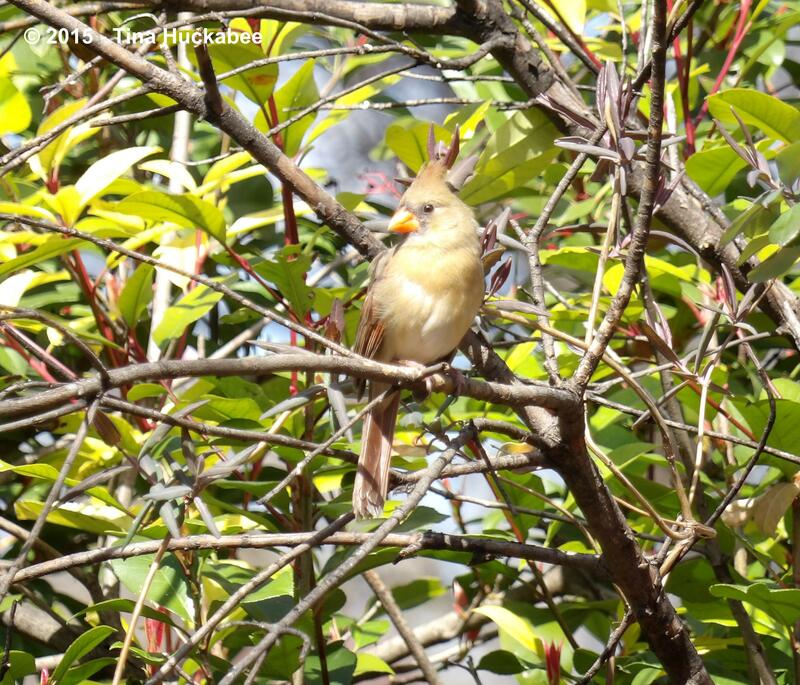 I see male Northern Cardinals everyday, but the ladies are shyer and elude the use of my camera with their quick movements through the cover of trees and shrubs. I find them as attractive as the masculine of their kind. 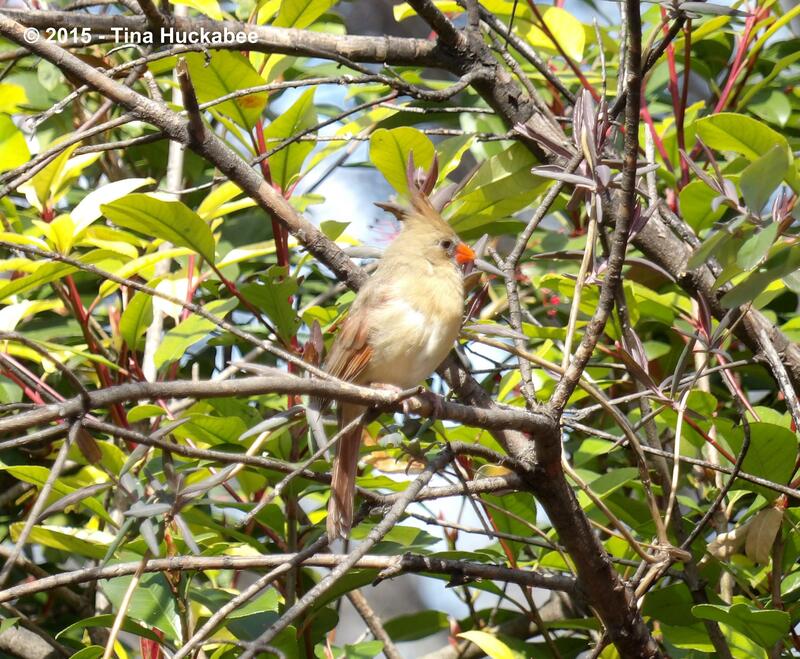 This lovely lady Northern Cardinal, Cardinalis cardinalis, was not so flighty as is typical of her female friends. 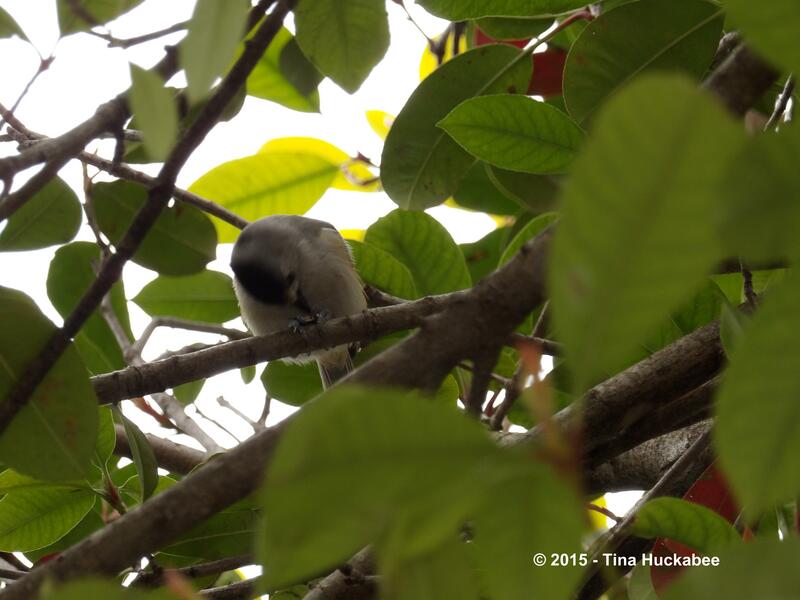 She landed and sat in the woody shrub for a long while before taking flight to another. I love the funny, quizzical look on this female Lesser Goldfinch, Spinus psaltria, stopping for a sip at the bar. 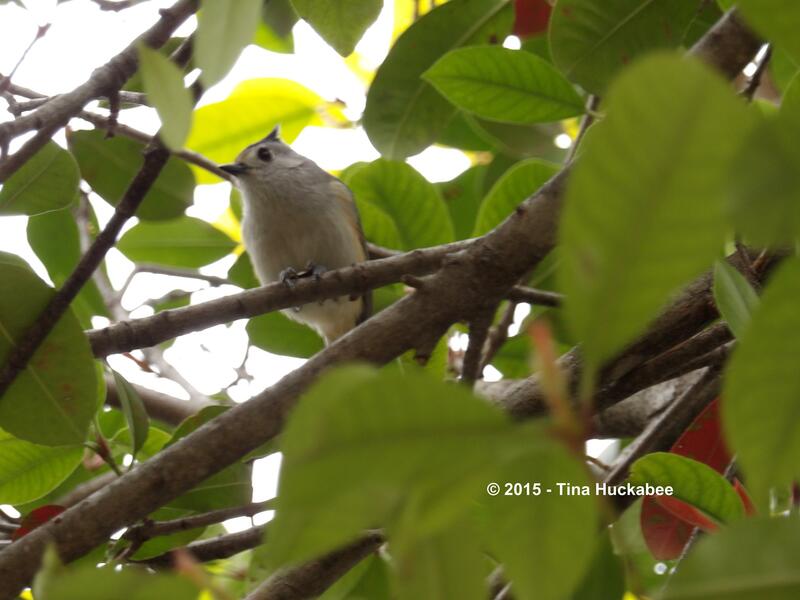 This Black-crested Titmouse, Baeolophus atricristatus, landed in a small tree after snatching a seed from the feeder. 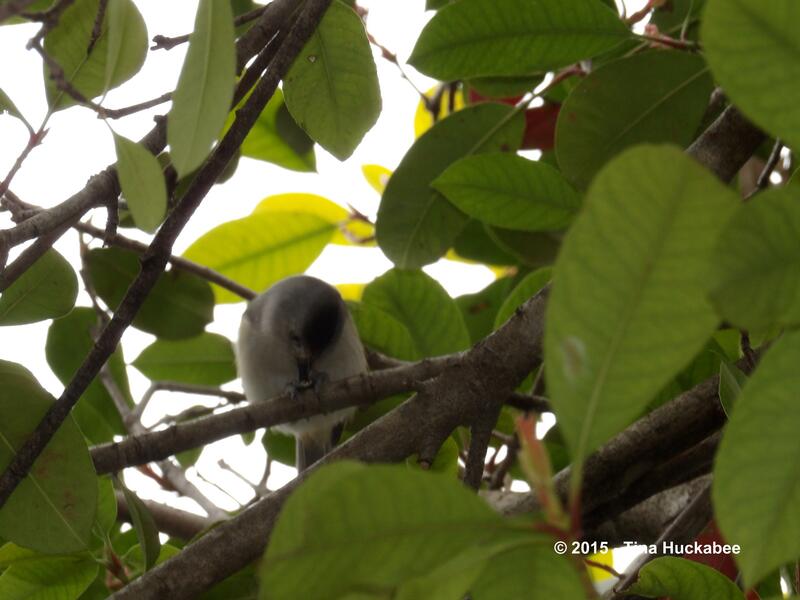 …and finally, mmmmm, that seed is tasty. I introduced this handsome dude, a Red-bellied Woodpecker, Melanerpes carolinus, in my last post. He’s part of a couple, no doubt gearing up to raise a little family of redheads, though I don’t know where their nest is. Not in my garden unfortunately, but he does visit. I hope wildlife shared your gardens this month, even though winter retains its icy grip on so many places. 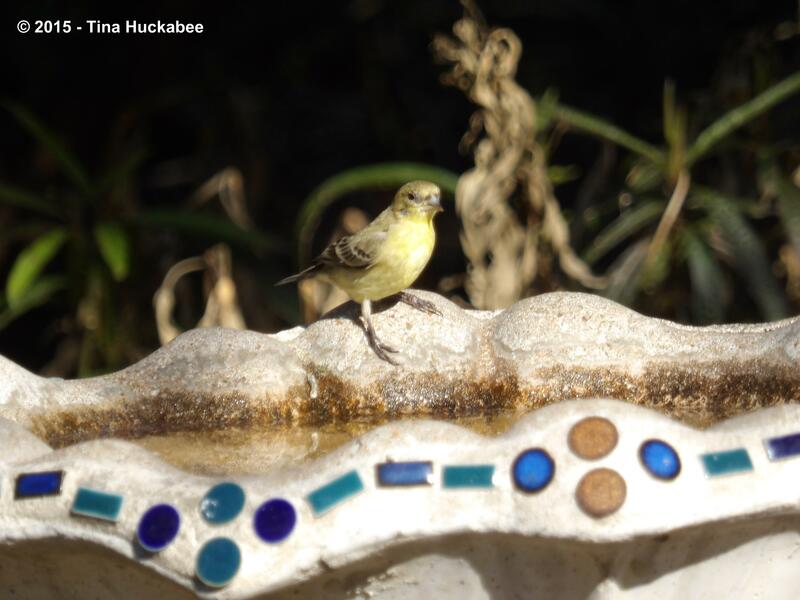 Please join in posting about the wildlife in your gardens for March Wildlife Wednesday. Share the rare or mundane, funny or fascinating, beneficial or harmful critters you encounter. When you comment on my post, please remember to leave a link to your Wildlife Wednesday post so we can enjoy a variety of garden wildlife observations. 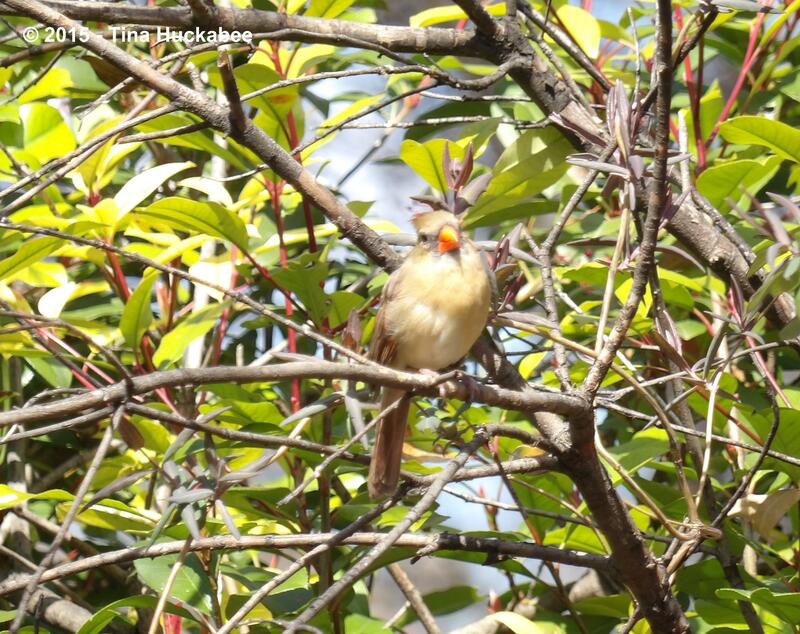 This entry was posted in Wildlife Gardening, Wildlife Wednesday and tagged Baeolophus atricristatus, Black-crested Titmouse, Bombycilla cedrorum, Buteo jamaicensis, Cardinalis cardinalis, Cedar Waxwings, Haemorhous mexicanus, House Finch, Lesser Goldfinch, Northern Cardinal, Red-tailed Hawk, Spinus psaltria by Tina. Bookmark the permalink. Love these photos! And, especially like that you are precise about identifying your gals and guys (a little bit of thing with me, I must admit). Thanks!! I’m not very good at bird ID–I get the obvious, but some birds are just too hard. I guess what’s really important, is that they can tell the difference. Aren’t they just the prettiest? Those colors, just wow! They did have fun bathing that morning, though I haven’t seen them since. The woodpecker is quite gorgeous and it’s fun to have him and his mate around. I have lots of trouble identifying the smaller hawks, there are several which (to me) look so much alike. 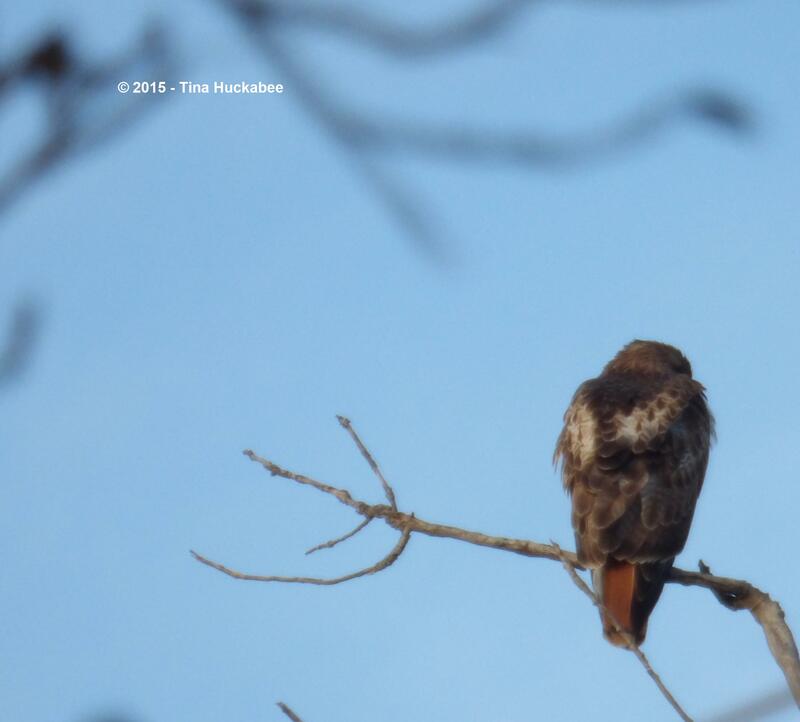 The red-tail is huge, so I usually get that one correct. Thanks for participating in Wildlife Wednesday!! Ahhh….now I have wildlife envy. 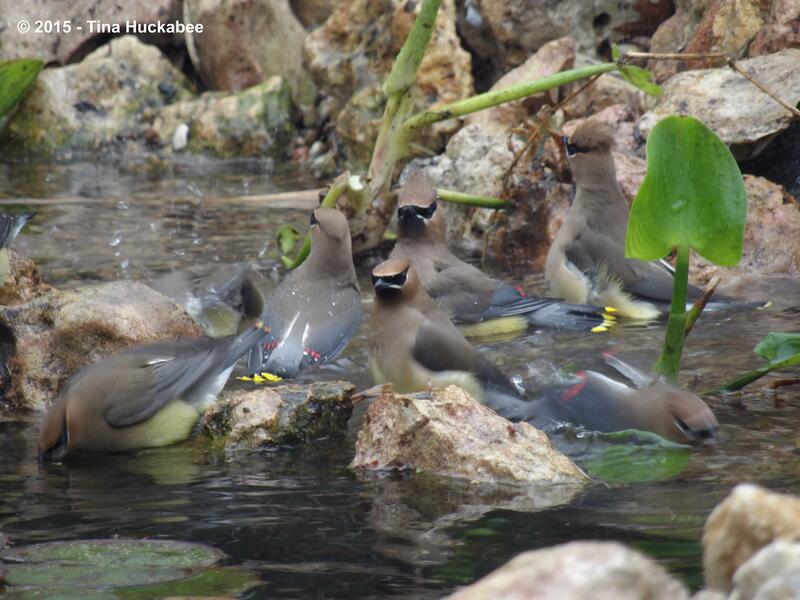 Those cedar waxwing shots are absolutely stunning. I’ve had groups pass through here before but didn’t see any (except online) this year. 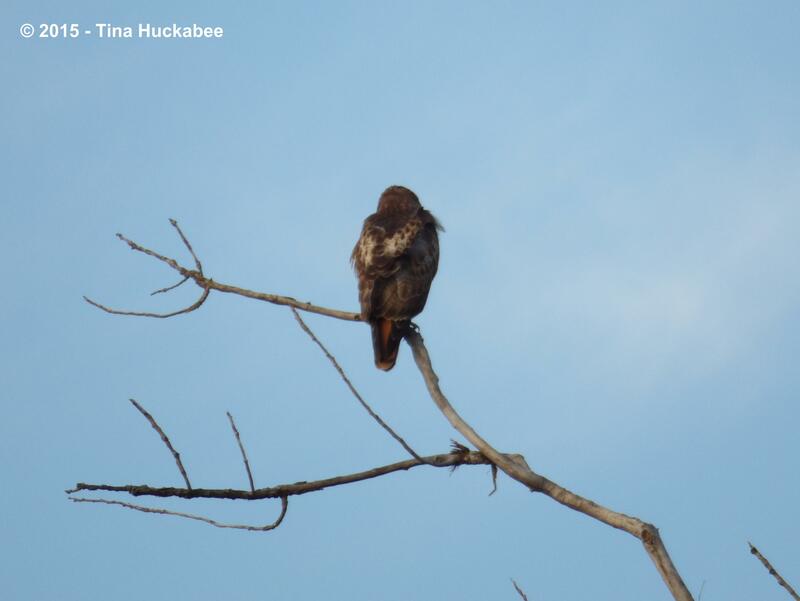 And if there ever was a photo more aptly demonstrating why certain hawks are called “red tailed”, I haven’t seen it. My post this month contains good examples of what for our area passes as “mundane”, but I’ve enjoyed our visitors no less for their familiarity. Here’s to gardening for the critters! I’m happy to celebrate Wildlife Wednesdays and the end of Winter both! (and thanks as always for hosting). There have been quite a few birds this winter–I’ve really enjoyed that, I must admit. 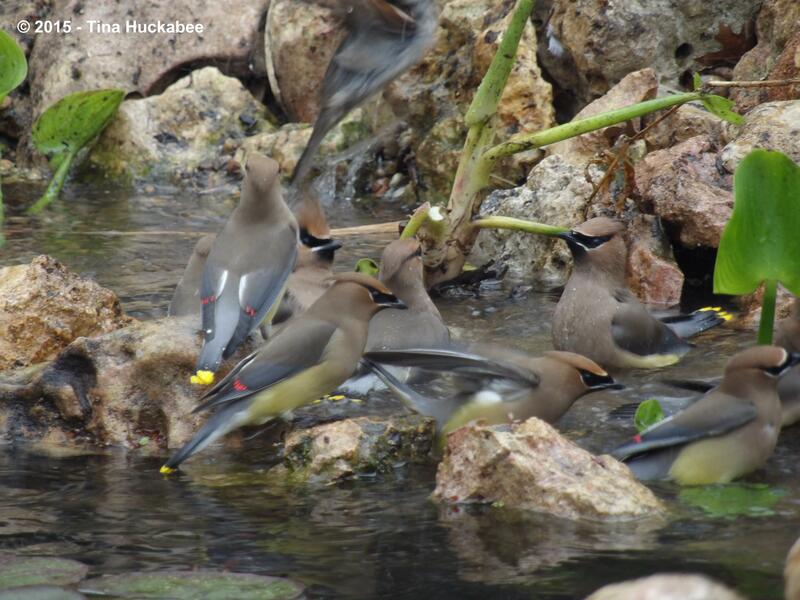 The cedar waxwings are flaky–I’ll see/hear them on one day and then it’ll be days before they swing through again. I’m still waiting for them to strip the Possumhaw of its berries–not too many takers yet on that. I enjoyed watching that hawk, but she’s shy with me–she flies off as soon as I spot her, it seems, to keep herself at a distance from me. 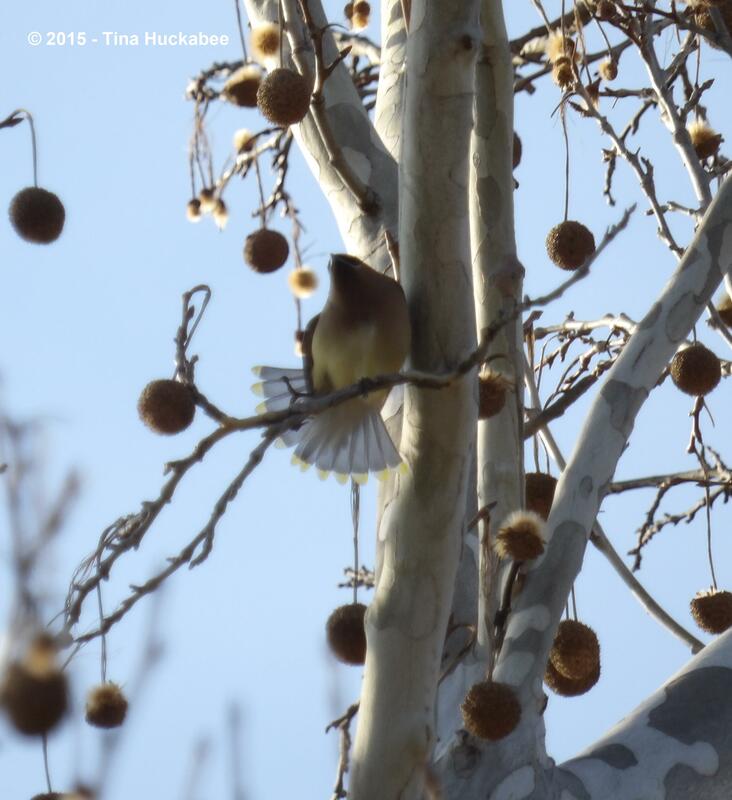 The tree that most of the photos were taken with the cedar waxwings is a Sycamore tree. I’ve come to really love that tree, too, though it’s not really recommended for this area. It is native, though farther east than Central Texas. They’re very common here. Thanks for participating in Wildlife Wednesday! Oh those Cedar Waxwings are special visitors to the garden. I haven’t seen any in several years, hope they return soon. The woodpeckers are so pretty, especially in the winter. We used to have quite a few and they seem to have moved on for now. I have a funny one for March. They are special and partly because they’re through here for such a short time. I wonder why you haven’t had any? You seem to have so much in your gardens. Thanks for participating–always a treat! Wonderful pictures, Tina! Once again I love the Waxwings. They seem less shy in your area! I especially like the buds on the tree a couple of them are sitting in. Is spring truly close? 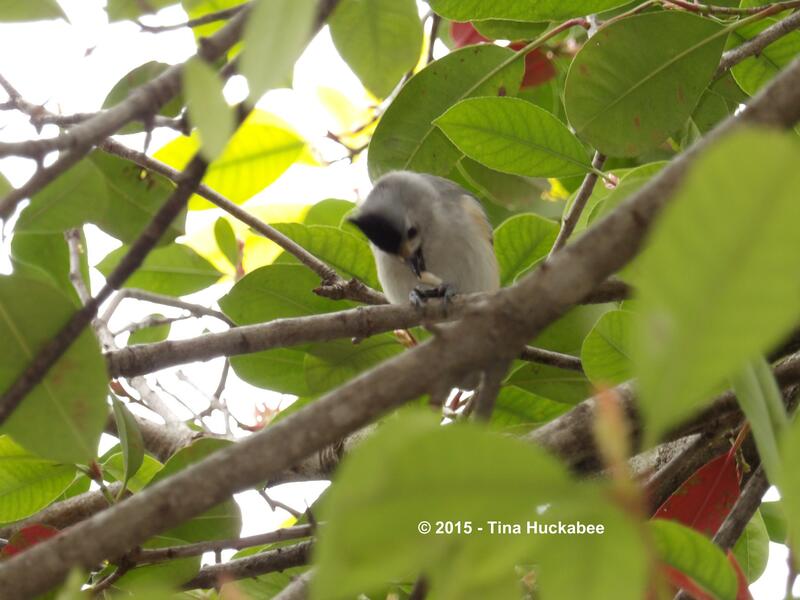 Please tell the Titmouse and Woodpecker to head up this way sometime. I’d love to see them. Mostly birds again but with a few extras. Thanks for hosting! 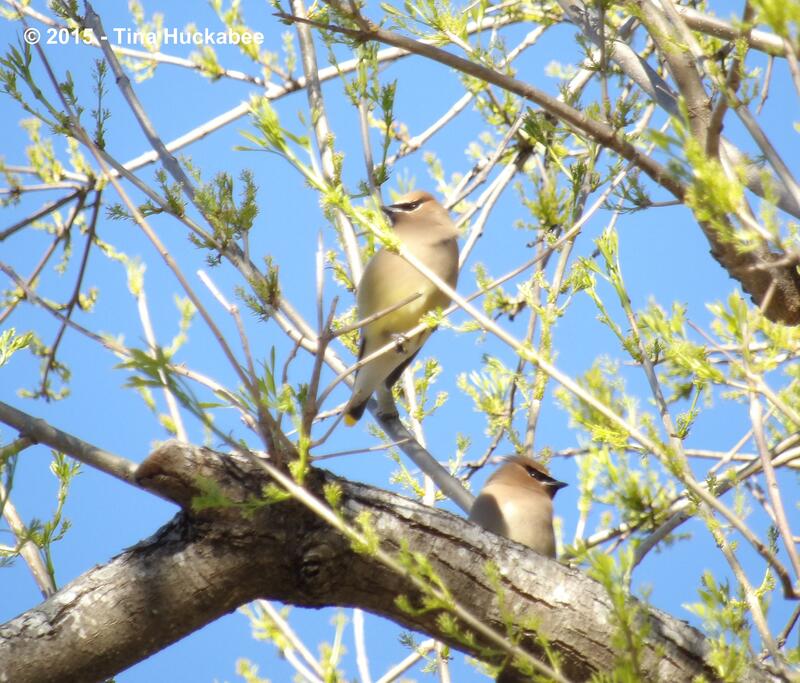 The Cedar Waxwings always land waaaaay at the top of the trees and always, in groups. They’ve been around here for awhile now, I’m not complaining. 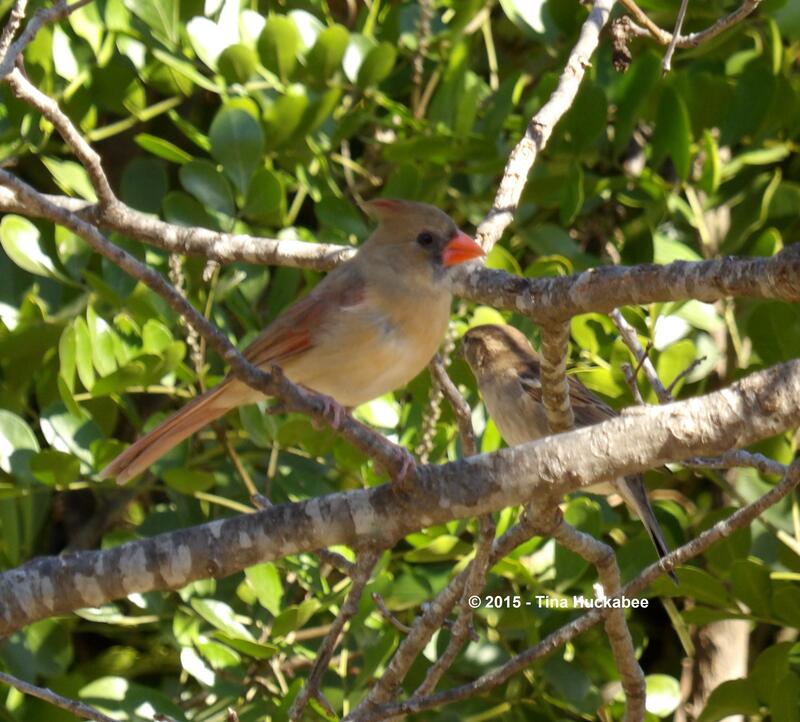 I will pass the word on to the titmouse and woodpecker, but I dunno if they’ll listen…. I’m glad you think the girls are as pretty as the boys! Party mode–ha, they seem like party birds, don’t they? Great bird watching all around, but the cedar waxwings are definitely my favorite. 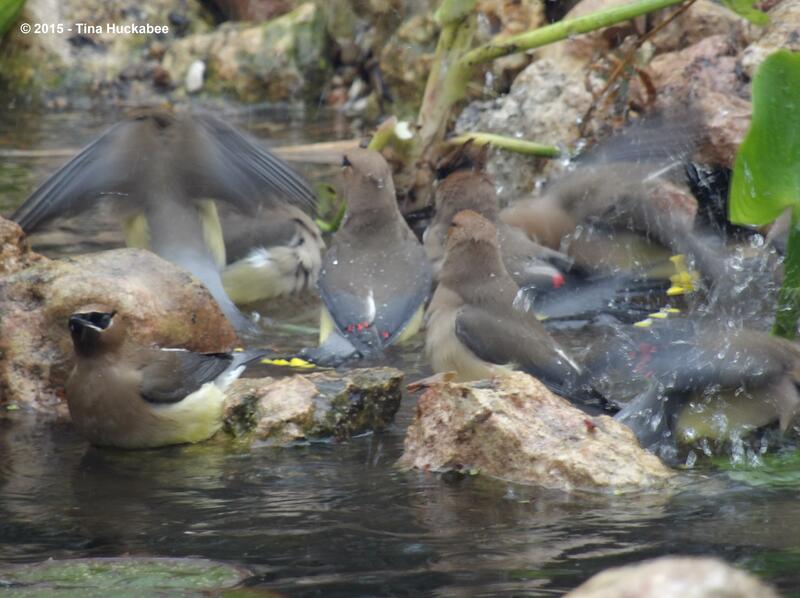 It must have been a delight to watch them enjoying your pond. 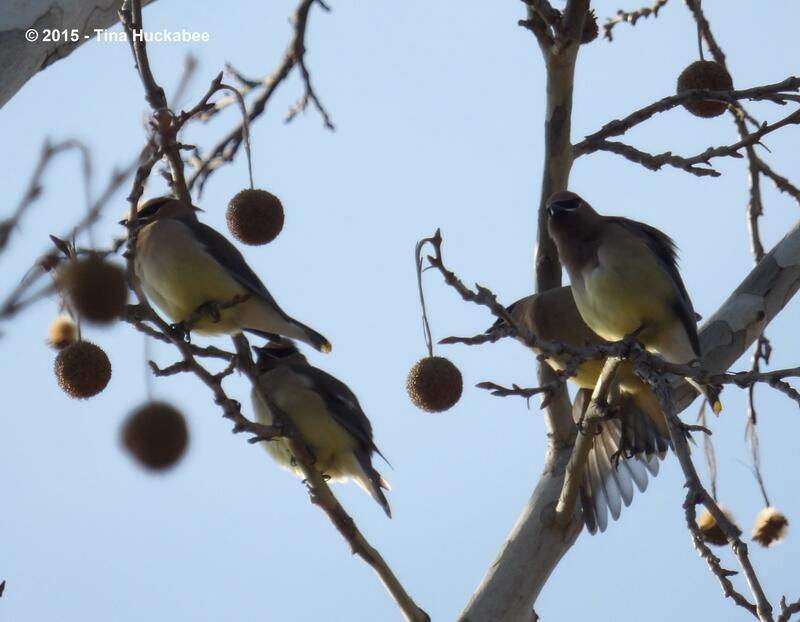 The cedar waxwings are definitely favorites of gardeners, judging from the sampling of comments on this post. I think one reason that I like them so much is that their visits are fleeting and I appreciate that short time. Tina you have loads of birds having a ball there….I am looking forward to the birds moving north soon as our weather warms and all this snow melts. Still cold here though. I especially love to see those waxwings….they should be headed our way soon and I hope to see them in about 6-8 weeks….I also am writing about them today and linking in on my new blog….hope you enjoy the post. They’re no doubt headed your way and soon. Enjoy them this spring and summer! 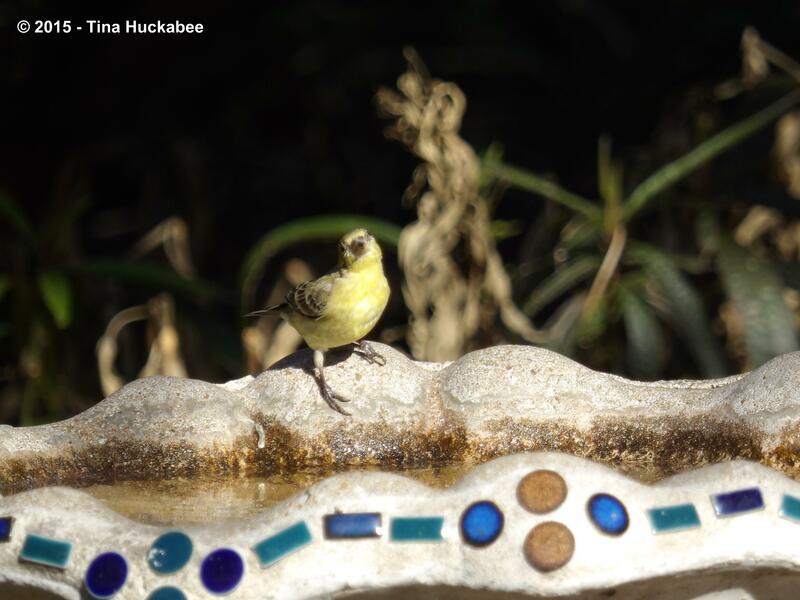 I’m looking forward to having all of these bird species visit my home garden this spring. Currently, here in Central Florida, the birds that seem to dominate in my parents’ neighborhood are Mockingbirds, Tufted Titmice, and Blue Jays, along with water fowl of various species. Birds are so entertaining! Hey Tina: I have a post up (a bit late): http://plantpostings.blogspot.com/2015/03/wildflowers-and-wildlife-at-cedar-point.html. Thanks for hosting! I’m so glad you posted and you’re very welcome! Thanks for participating. Your skies will be blue again. Actually, we’ve had lots of gloom and dark skies this winter. I won’t complain, because I know what kind of winter you’ve had.